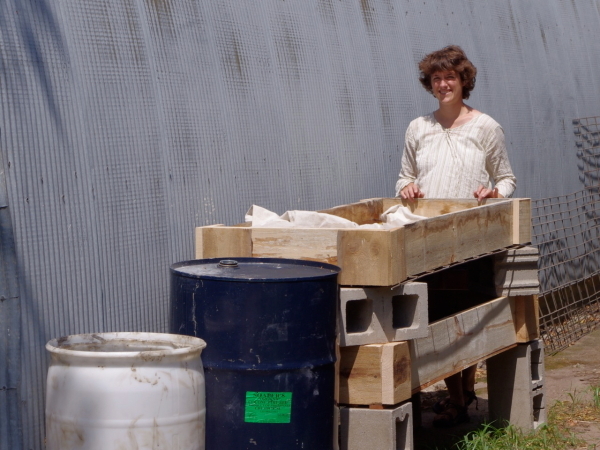 o this last weekend we started processing the clay. There are probably as many ways to process clay as there are to butcher a chicken, or mulch a garden, but like most jobs, some ways are better than others. Our process took several factors into consideration. For the moment we would like to use clay to make functional tableware so sticks, roots, leaves, rocks, and sand are not favorable additions to our clay. Clay is heavy and hard to move so it would be nice not to have to move it by hand any more than we have to. We would like to be able to fire the clay pots to cone 9 (around 2300 degrees Fahrenheit, depending on how you want to count it). And…we want the finished pieces to be durable, generous, sincere, and perhaps even beautiful. 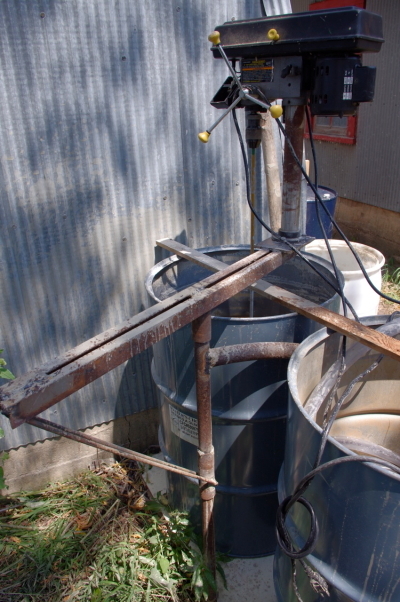 To solve this multifactorial problem we got a hold of a couple steel barrels, some angle braces, repurposed a small drill-press, clear plastic tubing, a dirty water sump pump, and some canvas. We decided to go with an oldie-but-goodie processing technique in the form of the Wedgewood Sliphouse Method, as in Josiah Wedgwood, circa 1730. This involves adding clay into a known volume of water and mixing it up with a machine called a blunger into a slip. 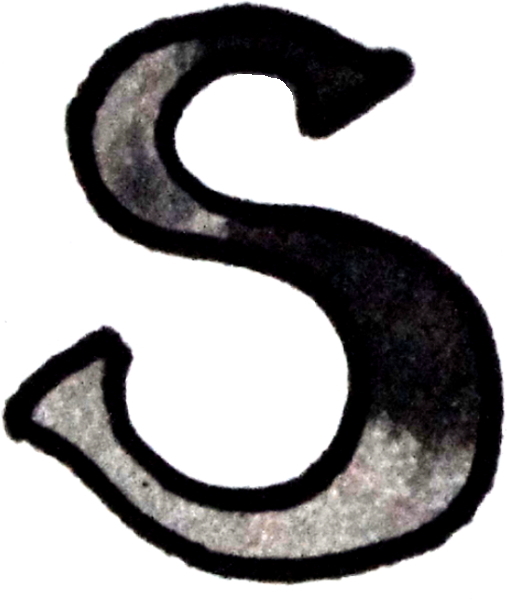 Slip is a clay term for clay suspended in water of a liquid consistency. Here’s the Designer with his double barrel blunger complete with swivel stand made with metal from the stanchions we took out of the barn. And here’s a look at the paddle bit for the drill press we fabricated to mix the clay. This blunging wins and winnows the clay, meaning that it takes out the roots, sticks, rocks, and sand, and leaves our clay suspended in water like a milkshake with leaf laden foam on the top and gritty bits at the bottom. 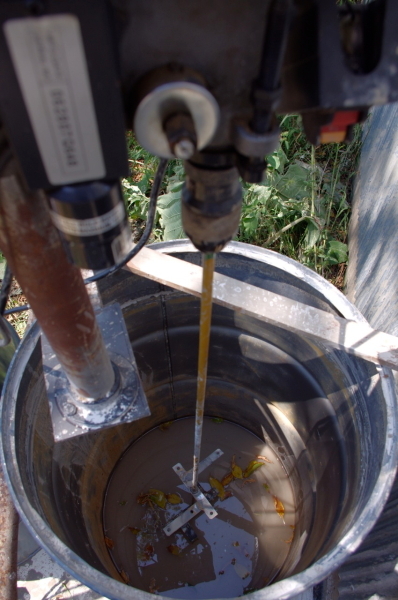 Then we pump the milkshake into a second container where we can add in dry form, the additional refractory clays and feldspars of our choosing to achieve a particular firing range. Here’s a different angle of the blunger with its swivel stand, and a picture of the drying troughs we built. Because the clay is suspended in water we don’t have to work too hard to move it once it is in the water. With the flick of a switch we can move 55 gallons of slip in three minutes or so with the sump pump to anywhere we can reach with a hose. The beauty of this method is that the only measuring that you really need to do is with a hydrometer, which is like a large thermometer but it measures density rather than temperature. If you know the volume of water that you start with you can figure out how much clay is in the water by how heavy it is. After discovering the clay last fall, we tested it by mixing it with varying percentages of higher temperature commercial clays, and firing it. We found that if we add twenty percent (by weight) of a refractory clay that our blended “clay body” will stand up to our desired temperature range of cone 9/10 or around 2300 degrees Fahrenheit. By doing all of the mixing in water dramatically reduces the airborne dust associated with clay production, and will save our lungs some trouble. 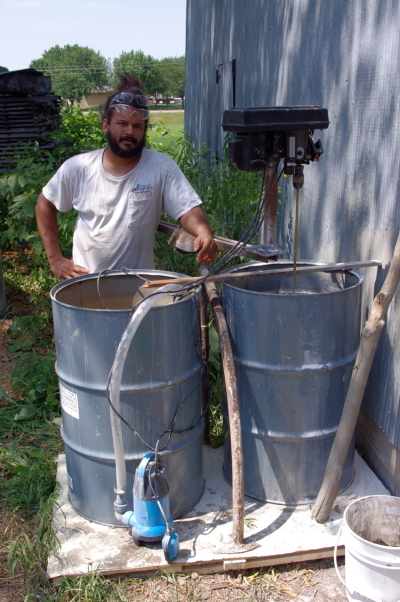 The last step is to pump the mixture from the second barrel into the drying troughs that we made with wood frames and hog panel (sturdy wire fencing) for a bottom, so the air could get at it from top and bottom. We lined the trough with a big sheet of canvas that allows the water to seep out of the slip, and when the clay is stiff enough, the canvas is also draped over the top to prevent a hard crust from forming on top. And finally, here’s the transformation. 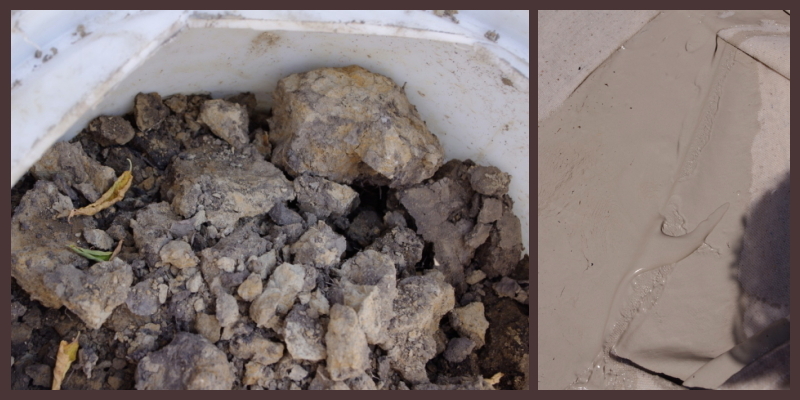 The ‘green hole’ clay straight out of the ground on the left, and as a cleaned slip in the drying trough on the right.